Nakhon Thai is a glittering diamond in the crown of Thai cuisine. The interior takes on a luxurious Eastern décor - elegant, dramatic and in authentic traditional Thai style. Beautifully lit, white walls are colourfully adorned with native ornaments, artwork and garden-like pots of ferns. The ground floor plays host to a bamboo-canopied bar where you can sip cocktails and nibble exotic snacks creating an exotic ambience to enjoy a lovely meal. Nakhon Thai is where flavour, quality, care, presentation and service meet to create an oasis in which to enjoy terrific food and pursue business, friendship, or romance. Nakhon Thai must be top of everyone's list for important launches, wedding receptions, fashion shows and events. There is a private dinning room seating 15 guests. The entire restaurant can be hired on request and accommodates up to 200 guests, customised entirely to your individual needs. Exclusive hire means you can bring your own entertainment. The staff are unfailingly polite and helpful. Happy hour runs from 5:00-7:00pm every Mon-Fri. There are over 50 wines to choose from. 30% off beers, 15% off wine. Available Mon-Fri 5-8pm. Karaoke nights every Thursday evening. The menu consists of 80 dishes that explore many of the regional aspects of Thai cuisine. 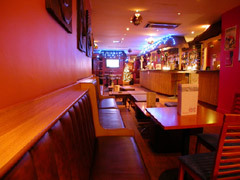 There is an a'la Carte section as well as a set menu of sumptuous curries. The pad thai is a must, of course, as it's the national dish. The drinks menu is genuinely varied, listing all sorts from juices and sherry to colourful cocktails and Thai beer.